Patricia "Tish" Bautista, wife of Commission on Elections Chair Andres Bautista, said her husband has unexplained wealth. Watch the video here. According to a report from Inquirer.net, Tish submitted an affidavit to the National Bureau of Investigation (NBI) last week, five days after meeting with President Rodrigo Duterte. She reportedly told the chief executive her discovery of several passbooks as well as bank and real property documents under the name of Bautista and some of his relatives which were not included in his 2016 statement of assets, liabilities and net worth or SALN wherein her husband declared a P176.3 million net worth. Tish believes that the poll chief might have amassed ill-gotten wealth worth almost P1 billion. Bautista, who was named in 2010 by former President Benigno Aquino III as chair of the Presidential Commission on Good Government (PCGG), which is tasked to go after the ill-gotten wealth of the Marcos family, and in May 2015 as Comelec chair, is "liable to be impeached should there exist valid and sufficient grounds to hold him in trial for an impeachable offense under Sec. 2, Article XI of the 1987 Philippine Constitution," the 47-year-old estranged wife said in her affidavit. 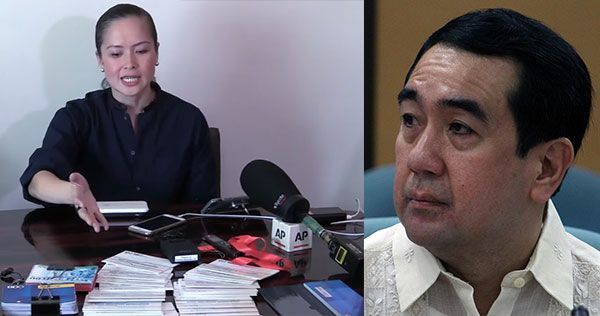 Tish revealed to the President and the NBI pieces of information that were not on Bautista's SALN including 35 Luzon Development Bank (LDB) passbooks with a total balance of P329,220,962; a foreign currency account with Rizal Commercial Banking Corp. RCBC) with $12,778.30; an RCBC peso account with P257,931.60; and HSBC account with HK$948,358.97, the report said. Bautista, on the other hand, told Inquirer that his wife's allegations are "a complete lie" saying it was part of her extortion attempt.